Bastion, the debut title from Supergiant Games, is an action RPG chosen to kick-off the Summer of Arcade downloadable festivities on Xbox Live. 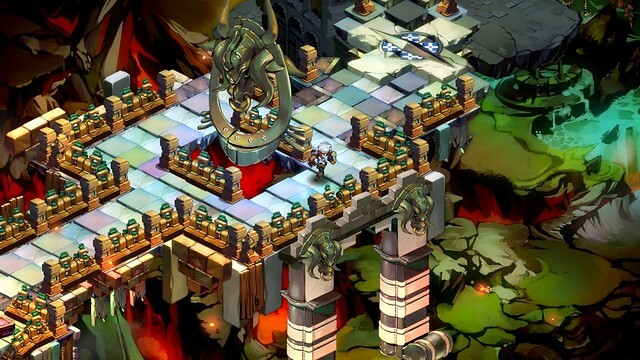 While fundamentally built upon many staples of its genre - such as elements of hack-and-slash combat, dungeon crawling and loot collection - Bastion distinguishes itself in seemingly endless ways, most noticeably through a colourful narrator who reacts to your every move. 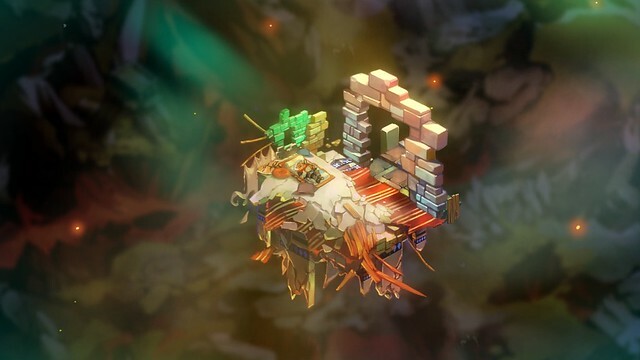 Beyond narration, the versatile combat, thoughtfully integrated mechanics, detailed and varied environments, memorable soundtrack, and intriguing plot all make Bastion an incredibly well-rounded package and a true testament to the skill of its creators. Bastion relishes in keeping players in the dark, slowly providing bits of context as the plot unfolds. Affectionately dubbed "the Kid" by the game's narrator, players awake to an unfamiliar setting and quickly find themselves tasked with picking up the pieces of a civilization torn apart by an event known as the Calamity. The only way to do this is by rebuilding the Bastion, a last line of defense for the Kid's people in troubled times. There's a great deal of ambiguity in Bastion. As mentioned above, the wider story is told primarily through allusion, casually referring to outside events but never giving a complete picture of them. This gives the impression there's always more at hand than you know and makes the fiction feel rich. Supergiant also use this lack of clarity to blur the lines between good and evil, friend and foe as they explore themes of imperialism and call into question the reliability of a certain storyteller. It's a carefully crafted tale that rewards the player's investment by the game's conclusion. Of course, the above successes were largely made possible thanks to the dynamic, ever-present narration. Rucks, the narrator, guides players through the hazy world of Bastion with a well-timed observation on something you're doing or explanation of an event. The writing and voice-acting sells the fiction well and adds considerable personality to Bastion. The deadpan commentary on otherwise mundane events adds a bit colour and gives players a real reason to play close attention. What's even more impressive is that Rucks almost never repeats himself, because so many contextual lines were written to anticipate player actions. One of my favourite moments was when Supergiant decided to showoff by having Rucks keep track of my stumbles during one particularly treacherous sequence, just as the thought was crossing my mind. The excellent narration is just one of the many ways Supergiant shows their masterful understanding of modern, user-friendly game design.Combat is another area that really shines in Bastion. At its core, players use a handful of buttons to perform relatively straightforward hack-and-slash maneuvers, but there's so much more hidden beneath the surface. Supergiant have quietly added layers upon layers of depth into Bastion's combat, ensuring skill and tactics factor into the equation. The game's excellent variety and balance in both weaponry and enemy types make for a versatile, satisfying experience. Players can equip two weapons to either of the main action buttons, and change this load-out at will between missions. Ranging from melee hammers and pikes, ranged mortars and rifles, and everything in between, there's plenty of variety to go around. The best part is that each weapon is useful depending on the situation or enemy, meaning players can easily experiment with the various combinations. Just when you think you've found the load-out to end them all, a new weapon is introduced that completely changes your perspective. Encouraging experimentation and constantly introducing new ideas are also prominently featured in Bastion's RPG elements and mechanics. Supergiant have brilliantly crafted a series of interconnected upgrade, collection and reward systems that, above all else, avoids forcing the player into blind choices by eliminating the barriers to switching. For example, at the Bastion's Distillery, you can equip spirits that grant unique abilities and can be changed anytime at no cost to the player. Additionally, gaining experience and leveling up out in the world opens up more spirit slots. The Distillery and all the other buildings that represent in-game systems are all connected in exceedingly clever ways. Bastion's design should serve as a model for future RPGs, an example of a modern approach that focuses on walking in the player's shoes. The meaty campaign, lasting roughly anywhere from eight to 12 hours, was clearly built with a second playthrough in mind. For starters, Rucks is keenly aware your replaying and makes the fact known multiple times. There are also several items that can only be used in a New Game Plus mode, which fortunately allows you to keep all of your weapons and possessions. Competing in the various challenge arenas and online leaderboards doesn't hurt either.What can be different the second time around is the difficulty. Thanks to Bastion's ingenious Shrine system, players can customize enemy behaviors by evoking the various ancient gods and their idols. Each idol has a unique impact on enemy behavior and any combination of the eight idols can be used at once. The brave souls who evoke them are rewarded with additional experience points, but it's completely optional. Again, the Shrine is a perfect example of the freedom players are given to shape their experience in Bastion. Much like the narration and mechanics, Bastion's presentation, in terms of both visual and sound design, is top drawer and adds substantial personality to the game. Each environment is a beautiful cartoon landscape, filled with detail, colour and variety. It's somewhat reminiscent of a more intricate, less-gory Fat Princess. Perhaps if you imagine the detail of Trine and place it in the cartoonish context of Fat Princess it makes more sense. I frequently found myself stopping to look at the scenery and watch the world build around me. I also took several breaks to take in Bastion's fantastic soundtrack. Each song is catchy and gets you in the mood for exploration and adventure. One particular subdued bluesy tune with a rare vocal performance really grabbed my attention and was nicely tied into the plot. One could argue that some of the musical styles used don't necessarily match what you'd expect based on the visual aesthetic, but it feel unique to Bastion in the best sense. I'm hard-pressed to think of a meaningful drawback, because the overall experience was so enjoyable. Here goes: a cynical person could argue the mission structure is merely an elaborate, extended fetch quest and that, on a base level, Bastion fits quite comfortably in its genre's conventions. While technically true, Supergiant have created such a rich experience around those two concepts that, for all intents and purposes, it becomes a moot point. 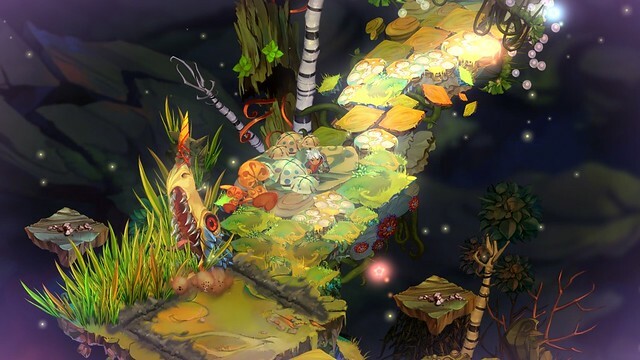 Bastion is an endlessly impressive game posing as a simple action RPG. The narration, combat, mechanics, aesthetics and story all feel carefully planned and equally poured over, creating a surprisingly deep and unique experience, one unlike anything else out there. This also makes Bastion an extremely player-friendly game that constantly presents clever ideas and choices where you wouldn't expect them. Budding game designers should look no further than Bastion for inspiration. Colourful narration and thoughtful story. Surprisingly engaging combat and RPG elements. Combat, while engaging, can sometimes end up feeling repetitive. Doesn't try to break out of genre conventions.